With the release of the Sony Alpha SLT-A55 and SLT-A33 in late 2010, Sony created a new category of camera, similar to a conventional digital SLR in many respects (same sensor size, lens mounts, general form factor) but with an ingenious technical twist in the way it uses the camera’s internal mirror. The A55 and A33 were bleeding-edge products whose novelty was impressive enough to overshadow some of their usability shortcomings. 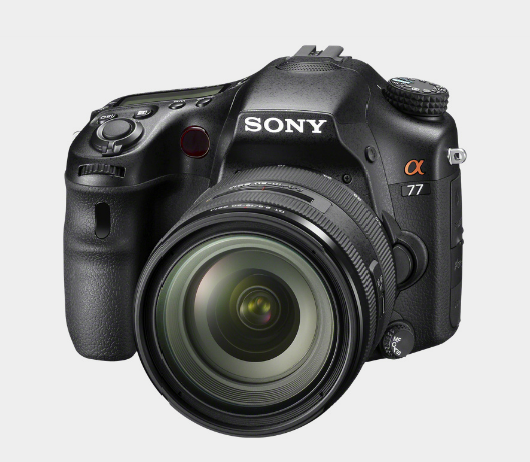 With the release of the Alpha SLT-A77, however, Sony has almost fully realized the promise of the earlier cameras. The 24-megapixel, 12-frames-per-second SLT-A77 is a grown-up, ready-to-work, 21st-century machine. The speedy, accurate phase-detect autofocus keeps up with fast-moving subjects, and the A77’s 24-megapixel resolution provides detail to spare, even at higher ISOs and after cropping. Shooting at 12 fps fills the camera’s buffer pretty quickly. I got this shot of the cowboy hitting the dirt the old-fashioned way: I clicked the shutter at the right moment. As noted in the Macworld review of the Sony Alpha SLT-A55, the new Sony SLT (single-lens translucent) cameras use a fixed translucent or “pellicle” mirror that lets most of the light coming through the lens go straight to the sensor, while also continuously bouncing a little of the light up to an ultrafast phase-detect autofocus sensor. The SLT design does mean a little less light reaches the imaging sensor than in a conventional SLR. Sony says the light loss is about half a stop. That sounds like a lot, but as a practical matter, it isn’t. 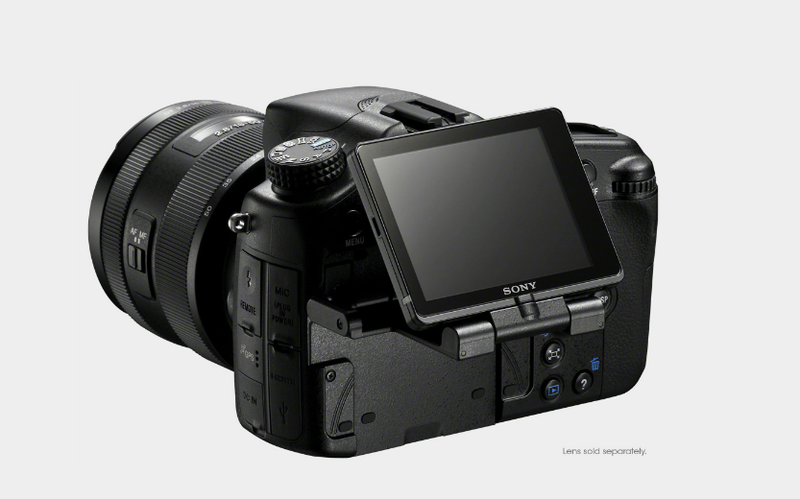 To compensate for the loss of light that the fixed translucent mirror causes, Sony increased the gain on the sensor slightly; that is, it made the sensor a little more sensitive. The downside of this new technology, as Macworld’s testing verifies, is that the A77 is a little noisier than DSLR counterparts such as the Nikon D7000 or Canon 7D, especially above ISO 1600. I took this photo of my living room on an overcast afternoon at ISO 3200. I shot it raw, with no noise reduction applied in post-processing. For the past couple of years, as sensor manufacturers such as Sony made it possible to take quite usable photos at ISOs that were unthinkable not long ago, high-ISO, low-light performance has become a bit of an obsession with enthusiasts—and reviewers. This is unfortunate. Great photos want great light, and always will. 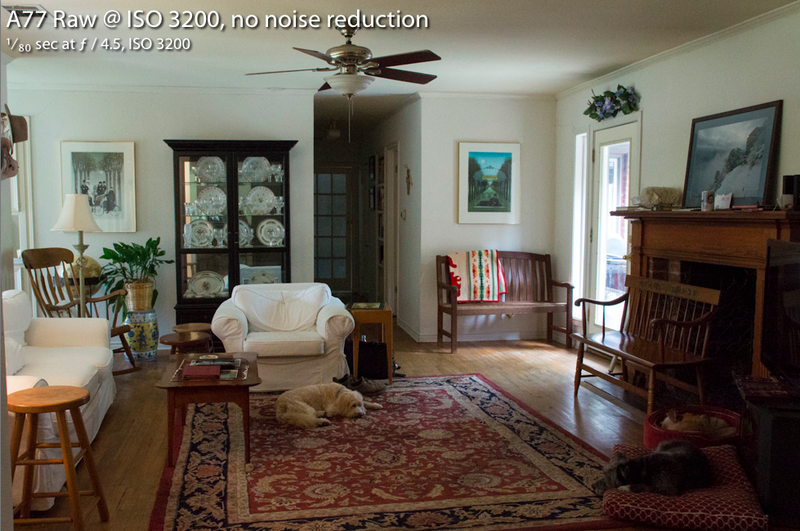 In any case, there’s more to a great camera than how noisy its images are at ISO 3200. A more practical indicator of image quality is the image viewed at its normal screen resolution, or even better, as a well-made print. And in that respect, the unprecedented 24-megapixel resolution of the A77's APS-C CMOS sensor works to offset the slight increase in noise. The A77’s 6000-by-4000-pixel images provide detail to spare for breathtakingly crisp prints, even at 13 by 19 inches. Cropped images from the A77 look fantastic too, both on the iPad’s 2048-by-1536-pixel Retina display and on my 21.5-inch iMac’s HD (1920-by-1080-pixel) screen. It is worth noting that the A77 applies noise reduction in-camera to JPEGs at higher ISOs; you can adjust the level but not turn it off altogether. Keep in mind that noise reduction (in-camera or on the computer) inevitably results in some loss of fine detail. My recommendation is to set High ISO noise reduction to Low in the camera's menus. For critical work, your best bet is to shoot raw and deal with the noise on your computer. In good light and at lower ISO (here ISO 320) the A77 produces clean, detailed images. In most situations, in terms of image clarity and color accuracy, the A77’s ultrahigh-resolution EVF provides a result that is, if not better than that of an optical viewfinder, at least close enough that most of the time I forget I’m looking at a digital display screen. The key to the EVF’s success is the OLED technology and the incredible resolution of the electronic viewfinder. There is just one situation that the EVF still struggles with: high-contrast scenes with both very bright areas and very dark areas. But optical viewfinders don’t do so well in all lighting conditions, either (for example, near darkness). The A77's EVF also brings with it a few special advantages. The most obvious one is that the exposure you see is the exposure you will get, or very close to it. Shooting in M mode with a conventional camera, you can easily spoil a shot by failing to notice the little ‘-2.0’ exposure value warning in your finder. But on an A77, you wouldn’t fail to notice that the scene you’re viewing in the finder is really dark. Even in one of the automatic modes—say, Program or Aperture Priority—if you want to dial in some exposure compensation, you don’t have to guess and take shots. Using the A77, you just press the +/- button, move the gauge a little, and see the results instantly. In addition to live, accurate exposure information, the EVF provides an overlay with useful information: a small histogram, a level, and more. I find the EVF terrifically useful, and I miss it when I work with one of my older optical-viewfinder DSLRs. The A77 provides outstanding color and detail when shooting conditions are ideal. The A77 also has a state-of-the-art live-view LCD monitor. The camera activates the EVF and turns off the LCD when your eye gets close to the viewfinder, then turns off the EVF (to save battery power) and activates the LCD when you take your eye away from the camera. This autosensing system works nicely most of the time, but it can be fooled: Occasionally the LCD went dark when I brought the camera too close to my face or my chest. The LCD tilts and swivels, and spins around. You can even fold it up and turn it around so that you can look at it while you try to take a self-portrait. I use manual focus a lot, and the A77 provides a couple of terrific aids: focus magnification and focus peaking. Focus magnification blows up an area of the scene, such as the subject’s eyes; I fine-tune the focus, and then take the picture. But I’m using the alternative, focus peaking, more and more. When this feature is enabled, the edges of whatever I’m shooting that are in sharpest focus are highlighted in a color of my choice. Manual focus on the Sony A77 is easier to use and more accurate than it has ever been on any camera I've used before. That creates a bit of a dilemma, because one of the big benefits of the SLT system is that it makes full-time phase-detect autofocus (PDAF) available, and the A77’s phase-detect autofocus, relying as it does on 19 autofocus points (11 cross-type), is generally about as precise as manual focus, and much faster. Unless I point the camera at something that has zero contrast, the camera almost always focuses the instant I press the shutter halfway. In very low light—in fact, even in complete darkness—the A77 focuses quickly and accurately, due to an autofocus assist lamp that throws a patterned highlight on the subject. Continuous PDAF works pretty well on moving objects, even while shooting video, but the camera doesn’t always track moving objects quite as tenaciously as the Nikon D7000 does. Moreover, the face-detection feature in the A77 is so good that I’m rethinking manual focus for portraits altogether. I’m getting soft. With the help of flash and a high-quality lens (here the Sony-Zeiss DT 16-80), the A77 brought out enough detail that I could count the hairs on my daughter Catherine’s head.